This comes from my game in the second round of the Moscow tournament, against a 1 kyu, who has already 2200 points EGF rating, so he's really 2 dan. Early in the game, I made a mistake in joseki. In the end, the result favoured ... me. I will discuss the several mistakes made, and I invite you to comment on them. If possible, can you give an estimate of how bad each mistake is in points ? White adopts a sansan strategy. I was surprised by , since I didn't know it. At would now be joseki. I thought it was submissive. Fighting spirit urged me to block at . This was a mistake and my opponent knew how to punish it. Pulling back to a and allowing him to cross underneath was out of the question, if only for reasons of shape. A Russian 5 dan told me it was probably best to abandon the bad move at and simply block at b. White gets the advantage, but the game is still playable (for an amateur). So again, fighting spirit made me play . Of course White cut at and I cut at . I confess I would not have found in a real game. Does anybody know how Black should continue if is at ? Perhaps the following? Dnerra: I confess if I had seen just this diagram, I would have expected it to be the starting point of a "What went wrong? "-thread, not to be a sequence quoted from a joseki dictionary. Doesn't White have more territory? OK, maybe Black's shape is a little better towards the center, as he can jump to a, but White cannot jump to b. I still like White a lot better here. Bill: Oh, the dictionary says that White is better, too. A peaceful continuation now lies in Black playing at a. Again White would be better off, but the game remains playable. Not with this tenacious guy. I played . 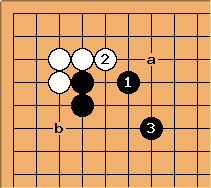 If White now answers at b, matters get only worse: I lose either the top stones on a large scale or the three stones on the left. Fortunately now my opponent chose to settle for peace, which is in my favour. A 4 dan commented that would have been better at a.
at . White has 10+ points. 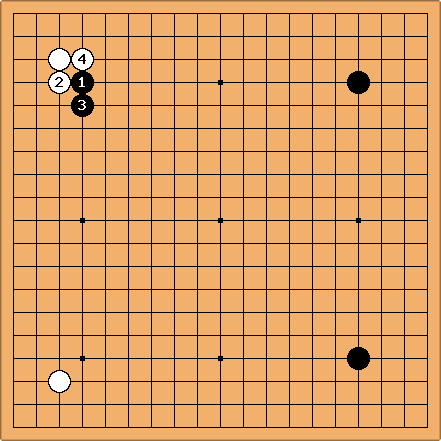 Black has a thick wall facing the center. White can cut at a, but that would only please Black, since he'll sacrifice two stones for more thickness towards the right. This result favours Black, but the difference is not so big, I think. Anyway, not something to repeat. BillSpight: The fact that White does not now want to cut at a shows the futility of - in the previous diagram. If White pushes through with , she should play atari at a right away. Also, - in this diagram is premature (if correct). Yes, it is sente, but not urgent, and there are larger plays about (such as a wedge on the right side). I'm not sure if is sente or not, but if it is, isn't this better than capturing ? And if it is gote, then it is clearly better than doing so (by definition). Steve Kroon: Also note that in the first diagram Black has the next move, while in the second diagram, White has the next move. Bill: White has the move in both diagrams. In the first, Black has played . Steve Kroon: Absolutely correct, sorry. Excuse my ignorance, but why would Black spend a move there now? Surely a move on the right side is more urgent? i.e. shouldn't the first figure have somewhere along the right side, and the position then evaluated taking into account that white could start a fight with a cut at the current ? unkx80: The move is a thick move. Assuming the surrounding areas are neutral, allowing White to cut splits Black into two groups... definitely I won't call this Black group a thick group anymore. Bill: Especially with the stone on the top right star point the connection is at least as big as an enclosure. White gets to pick a or b.